The IC-M604 has excellent receive specifications* which allow a weak signal a better chance of being heard when louder signals are around it. The powerful 5.0W (typical) audio output from the front facing speaker further increases the audibility and quality of received calls. * More than 80dB for intermodulation rejection and adjacent channel selectivity, and 0.22μV (typical) high sensitivity. No matter what channel you're tuned to, a separate and independent receiver inside the M604 continuously monitors Ch. 70. The 10-keypad allows simple and efficient operation of the DSC emergency functions, vital for your safety at sea. * NMEA 0183 format is required. This function allows quicker channel selection. Set the “TAG” channel to the channels used most often. When pushing the up/down buttons on the speaker microphone, only tagged channels are selected and untagged channels are skipped. The “TAG” scanning function detects only tagged channels. The optional COMMANDMICIII™ provides a 2nd and/or 3rd station capability to operate the IC-M604 from up to 18.3m* (60ft) away such as the cabin and/or fly bridge. * Requires use of two optional OPC-1541 extension cables. All functions of the IC-M604, including distress call, DSC, and hailer, are available. 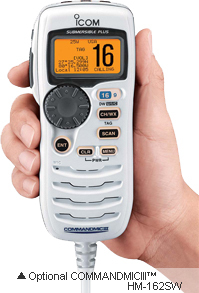 The intercom function allows you to talk with the IC-M604 or another COMMANDMIC™. Remote power on/off function remotely turns on/off the IC-M604. A newly designed multi-function rotary dial gives you quick and easy access to many IC-M604 settings, including operating channel, volume, squelch, menu settings and more.